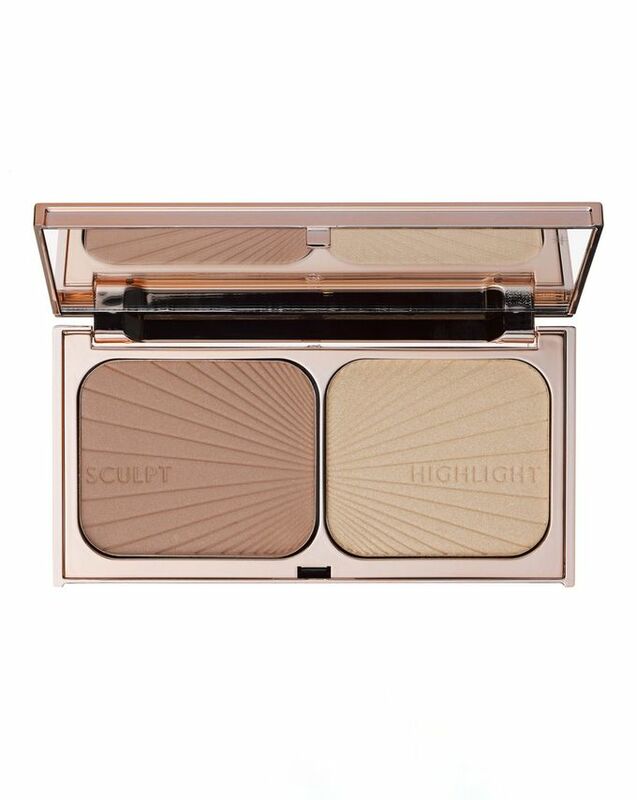 One of the original (and best) products to sculpt and highlight, Charlotte Tilbury's Filmstar Bronze and Glow duo stars a stunning, sunkissed powder to exaggerate shadows, while the accompanying gold-toned highlight grants a gleam to cheekbones, cupid's bow and inner corners of each eye. Charlotte's 'secret weapon' when it comes to creating ravishing red carpet beauty looks, choose from two shades for 'Fair/Medium' and 'Medium/Dark' skin tones. Bronze: Apply the shading colour to the areas you want to sculpt and define using a powder brush: the hollows of your cheeks, temples, jaw line, sides and tip of your nose. Never forget to blend-blend-blend! Glow: Apply the highlighter on top of the cheekbones, down the centre of the nose, the cupid's bow and brow bone to give you candlelit skin. This is my best highliter! It’s very smooth and natural glow! And very delicate bronzer. The hype is real. I have very fair skin, Alabaster in Bobbi Brown or Cloud in Too Faced and the sculpting shade works great with my skin tone. And not to mention the highlighter which is absolutely amazing, it gives the most wonderful ”lit from within glow” that also compliment my fair skin. I think this is my fav CT product, the shade of the bronzer is so perfect and looks natural in my skin tone. Love-love-love this product. I have fair to medium version and it looks amazing on my skin. You will never have a dark spot on your face. Really natural beautiful bronzer. Some people tell that the highlighter is not good enough for such a price - don't listen to them. if I need shining from the space I take Becca or my lovely Anastasia Beverly Hill, but if I need a natural glow and light on my cheekbone, I always use CT. I like this one for a foolproof, I-woke-up-like-this look. 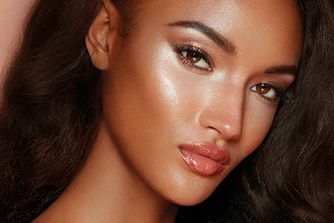 The bronzer/contour shade is very subtle no matter what you do, but the highlighter is buildable - it can go from light gentle glow to full-blown LIGHT. I like it, but not "totally spend these 49 pounds again" like it. I bought this as a treat but I honestly use it every single day. I'm quite pale and I love it because the bronzer is finely milled and blends out nicely. The highlighter is very natural, so is nice for daily use but I wouldn't use it if I was going out as it's very subtle. It is pricey, but as I use it every day I can't complain. This is absolutely perfect. The highlight isn’t one of these tacky “glowing from the gods” highlight, it’s a sultry candlelit glow from within, not glittery at all. The bronzer isn’t chalky but melts into the skin. An amazing duo will absolutely repurchase. Amazing product. The highlighter is just the perfect colour for me (I'm MAC shade NC25) and the bronzer as well. Was never able to find a bronzer that doesn't look crazy and dark but this one is very subtle and simply perfect. Packaging is beautiful as well. I feel like this product just really adds to skin rather than being obvious which is my number one wish for makeup on a day to day basis. The bronzer is lovely and really adds definition without being obnoxious and can be built up for a more oomph look. The highlighter is really incredible and just glows you up. If you want something that's not incredibly obvious but beautiful and makes you glow from within, get it!! I really don't get the hype. The contour shade and neither the highlighter does not show up on my skin. And I am so pale. I just really dont understand it especially for its price. Don't recommend. Give a wonderful complexion. Packaging is very beautiful and powder so sweet. I'll order again. My favourite bronzer ever!! I prefer this over my too faced and Nars laguna. Its very pricey but it is worth it and the packaging is just amazing. The highlight is ok, I have better ones in my make up collection but its ok. I would re-purchase this. Beautiful shades of bronzer&highlighter in Light. Subtile sheen. Packaging is gorgeous! Very flattering shades. Was so reluctant to buy this product due to the price, but I am so glad I did! By far my favourite product. Amazing quality and good size pans! Definitely worth your money. I have really fair skin, but the bronze shade still looks incredible. Love the contour shade. I'm very pale so its difficult to find a nice contour that is soft with ash undertones and doesn't make you look orange but this is perfect for me! The highlight was a tad disappointing (too subtle) but its still one of the best I've used. My favorite makeup product by far!! 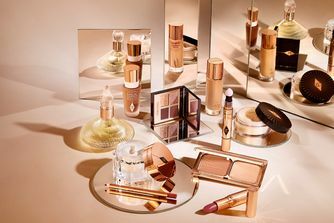 This makes my skin look angelic and radiant, so so so pretty...and the amount of product is very generous, I absolutely think its worth every pound. I'm usually as sceptical as they come but I really do love this product. I've got Fair/Medium one - because I'm white as a ghost - and the bronzer is subtle and blends really well. The highlighter is lovely - it lights up the face without making you look like a robot. I've actually received compliments on looking "glowy and pretty" since wearing this. Well worth the investment. I adore this product! I'm extremely pale but the sculpt side looks still natural and gorgeous on my skin. And the highlight...oh so beautiful! One of my absolute favourite highlighters! Plus the packaging looks so luxurious and chic! This is a true holy grail. Every time one runs out I say I'm not going to replace and then bam, I miss it so much I have to get another! 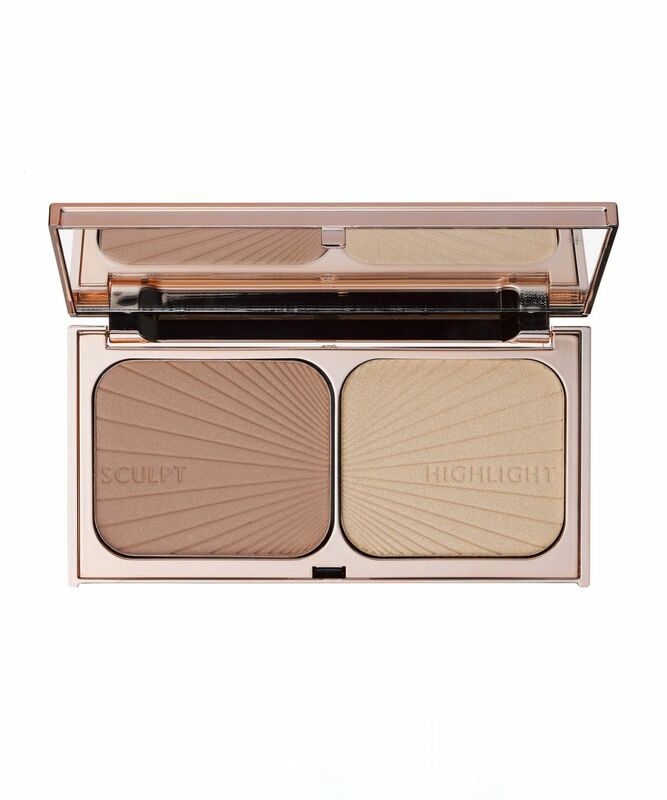 Great silky smooth powers, amazing non shimmery bronzer which sculpts the cheeks and a cute highlighter, great to use on the eyes too. I am so happy I took the plunge and bought some Charlotte Tilbury make up. What can I say about this Bronzer and Highlighter? It's amazing!! It’s the perfect colour! It looks so natural on the skin!.The bronzer is perfect for me as I am fairly pale and I find a lot of bronzers are just way too orange. The highlighter is lovely, not too shiny and glittery, perfect for every day use.Totally a Best Buy! Прекрасная палетка, такая прекрасная, что я запаслась второй палеткой! Бронзер смотрится очень гармонично, сливается с текстурой кожи, правильного оттенка. Получается здоровый загар лица, лицо приобретает лоск с помощью тандема в виде бронзера и хайлайтера. Хайлайтер не яркий, но очень благородный и спокойный. Лицо выглядит дорого и ухоженно с этой восхитительной вещью! A beautiful palette, so beautiful, that I stocked up with a second palette! Bronzer looks very harmonious, blends with the skin texture, the correct shade. It turns out a healthy tan of the face, the face gets a gloss using a tandem in the form of a bronzer and highlighter. Highlighter is not bright, but very noble and calm. The face looks well-groomed with this amazing thing! Это лучшее средство для скульптурирования лица, которое мне доводилось использовать. Деликатные цвета, с которыми невозможно переборщить. Темный оттенок дает очень аккуратную тень, не рыжую. А хайлайтер делает кожу моментально холеной и сияющей, но не как блин. А ещё это палеткой можно сделать натуральный макияж глаз! Вообще косметика этого бренда потрясающего качества! ***This is the best tool for sculpting the face that I have ever used. Delicate colours that cannot be overdone. The dark shade is the perfect tone, not orange or red and the highlighter makes the skin instantly sleek and radiant. This palette can make natural eye makeup too! The cosmetics from this brand are of amazing quality! Love this product. I held off from buying it because of the price and took advantage of an offer that came up . I was so glad I did as it has become my new favourite. It's very natural and understated, yet buildable if you want a more dramatic look. I love the highlighter. It really does make your skin glow giving a candlelit look, as Charlotte puts it. Очень довольна данным продуктом : скульптор в мягком не слишком теплом, но и не слишком холодном оттенке. Отлично "работает" на коже, можно использовать в качестве бронзера. Хайлайтер в цвете "шампань" также ложится очень мягко. Насыщенность оттенка зависит от степени интенсивности нанесения продукта. Упаковка потрясающая. Удовольствие от использования продукта. ****** Very pleased with this product: a sculptor in a soft not too warm, but not too cold shade. Excellent, it "works" on the skin, can be used as a bronzer. The champagne highlighter also lays down very softly. Hue saturation depends on the degree of intensity of the product. The packaging is awesome. The pleasure of using the product. I avoided to spend this much on this product for ages but decided to finally take the plunge and do it. How glad I am. The bronzer is pretty much foolproof. Not too intense what allows you to build it up without looking too much. It's warm (which I almost always hate on me) but it's a beautiful and natural shade. The highlighter, that I feel everyone kind of "doesn't care" is one the most beautiful ones I have. It's natural but you can also build it for a full WOW effect. If you're into the "glow from within" this is the one. It's a nice bronzer, but as with a lot of CT products, it's a little underwhelming for the price. The bronzer is a good colour, but a little too sparkly for my taste, especially combined with the shimmery highlighter. However, if you like the more shimmery look then I guess it's perfect! It's not a particularly robust product, mine shattered after quite a minor drop! This must be the most natural bronzer I've ever owned! Gorgeous compact as well! Love it. This is a great universal bronzer but it's not good for contouring. Also the highlight shade is really subtle so subtle I cant see it! OK item for a high price. Not worth the hype. I held off buying this as I really didn't want to pay £49 for it. But temptation got the better of me and I am so glad it did. I got the light medium, it's perfect for every day subtle, but can be built up for a more dramatic evening look. Highly recommend this! The duo is amazing. So versatile and it looks flawless. The highlighter is natural, perfect for everyday use. Highly recommend. It's a great product with a gorgeous quality and the packing is perfect, but I have a light-medium skin tone and the contour shade it's very subtle. I really like the highlighter, it's the perfect champagne shade, very natural but not too bright. I love the bronzer shade on my fair skin. It gives dimension without being too obvious. The highlighter is pretty, but it is slightly too dark for me. The best bronzer/contour I've ever used will never use any other. I just wish they sold the bronzer separately as I don't even touch the highlight it's very very subtle. This is the must-have at my makeup kit now. The highlighter and contour both are very delicate and create very sophisticated and expencive look. Definitely will order again. This is just perfect! Super beautiful packaging and the shades look so natural. I was kind of confused about which one to get as I'm nc25-30 in MAC, but I picked fair/medium. From beautiful packaging to beautiful product - I love using it to gently enhance cheekbones and sculpt away areas that needs to be sculpted whilst highlighting top of cheekbones, inner eyes and under the brow as well as above cupid bow. The highlighter is gentle, very flattering and naturally radiant on the skin. The colour tones are just perfect to naturally enhance the skin and it doesn't create harsh looking sculpting. Me han hablado muy bien de él. Sirve hasta para sombra de ojos!! *** This products works very well. It can even be used as eye shadow. I love this. Charlotte takes on the world of Beauty.